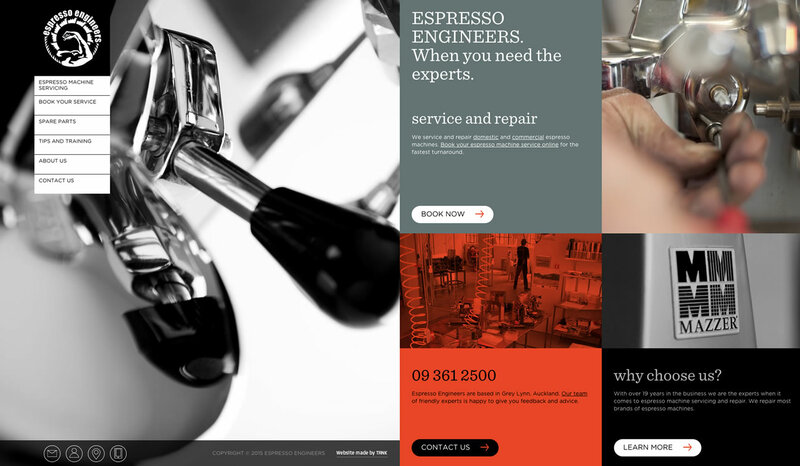 Website Projects • Our Work • Client : Espresso Engineers. E-commerce + Retail, Catalogue, Distributor, Responsive, Company + Profile website developed by TANK Web Supply, Auckland, New Zealand. Auckland based Espresso Engineers are New Zealands oldest espresso machine servicing company. We were asked to create a unique online experience to set them apart from the competition. The result is a modern design, optimised user experience complete with online booking forms. The responsive website is optimised for a range of devices. An appealing and simplified booking form adds to an overall enhanced user experience. Bold colours and strong photography are combined with clear calls-to-action guiding the customer into the website. The elegant design is reflected in every aspect of the site, including the live google map. Need your Business website enhanced?